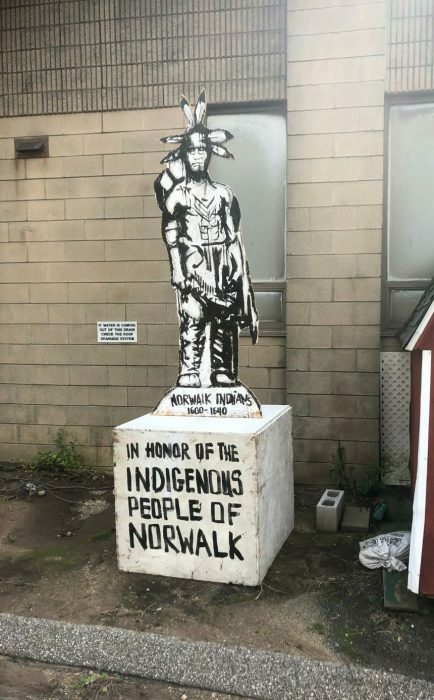 A West Avenue pop-up art installation, noticed Wednesday by a NancyOnNorwalk reader, honored “Norwalk Indians” less than a week before Columbus Day. The sculpture was quickly removed by the Recreation and Parks Department. NancyOnNorwalk drove by the area Thursday afternoon but the statue was gone. It had been on a strip of land adjacent to the ramp onto Route 7, just down the street from Heritage Park, at 194 West Ave., Norwalk Communications Manager Joshua Morgan said Thursday. The public land is maintained by the City. “It’s important we recognize and honor the diversity across our city. Many Italian-Americans use Columbus Day as a way to celebrate their heritage, and it’s equally important to remember the native people who were here long before us. 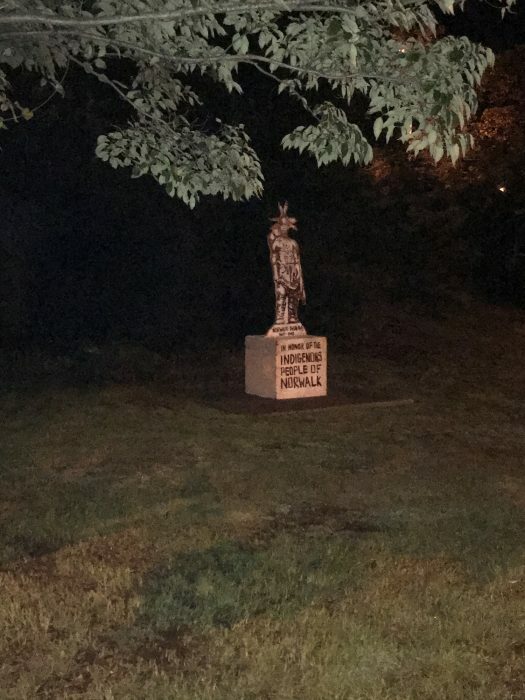 “Recently, an Indigenous Peoples’ Day statue was placed along West Avenue and was subsequently removed by Recreation and Parks staff. This is not political. Any statue or work of art placed on public property without approval from the city and Recreation and Parks Department will be removed. 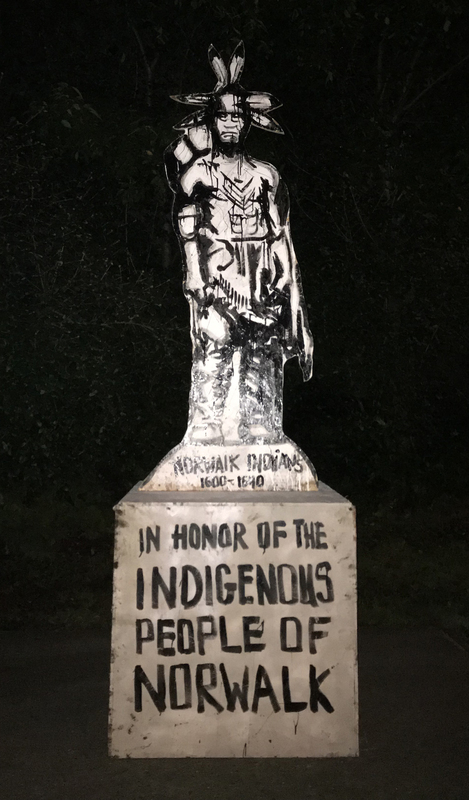 The West Hartford Board of Education in March voted to have West Hartford Public Schools switch from marking Columbus Day to recognizing Indigenous Peoples Day. Bridgeport Public Schools made the switch in 2015. In August, archeologists announced a major discovery of the remains of a Native American fort from the 1600s, unearthed in Norwalk as a result of work related to the Walk Bridge project. Artifacts uncovered include wampum, glass and copper beads, stone arrow points, European flint, and iron trade tools. People are being ticketed for “cumulative parking” in the Wall Street area, former Common Council Steve Serasis said recently. Someone who parks in a Wall Street during multiple visits over the course of a day may receive a ticket if the total parking time exceeds two hours, Serasis explained. “It’s free parking so it’s a balance on how you enforce these time limits,” Administrative Services Manager Kathryn Hebert said Wednesday, responding to that concern. Serasis spoke at the recent Coalition of Norwalk Neighborhood Associations (CNNA) forum focused on the future of Wall Street. Less than a month ago, an elderly gentleman told Serasis that he’d had breakfast at the Family Diner and then come back for lunch at the New York Bakery, and gotten a ticket because the Parking Authority is issuing tickets for cumulative parking between 8 a.m. and 6 p.m., Serasis said. “This is stifling people coming into the area,” he said. Serasis’ concern was the first topic brought up by the public at Wednesday’s Norwalk Tomorrow meeting seeking input on parking issues in the City. There’s a two-hour time limit, something that Walker Consultants will review as part of the City-wide study, Hebert said. She said that Wall Street-area businesses have complained about people who work there “jockeying cars” by changing spaces throughout the day so they can have free parking. The Authority is “chalking cars” to keep track of who’s on the street but is issuing warnings, not tickets, she said. NancyOnNorwalk emailed Hebert and Redevelopment Agency Executive Director Tim Sheehan on Monday, to ask about Serasis’ comment. Hebert did not reply; Sheehan replied Friday, after this article was published. ” I brought the issue to the Parking Authority Meeting last Wednesday, Laz claimed that is not their enforcement policy and the Commissioners indicated that they also did not recognize it as any approved enforcement policy,” Sheehan wrote. AB Square LLC bought 32 Algonquin Road in April from the Bank of America, Norwalk GIS reports. The sale occurred after a foreclosure, the resident said. About a month ago, someone gutted the kitchen and dumped the debris and appliances in the driveway. 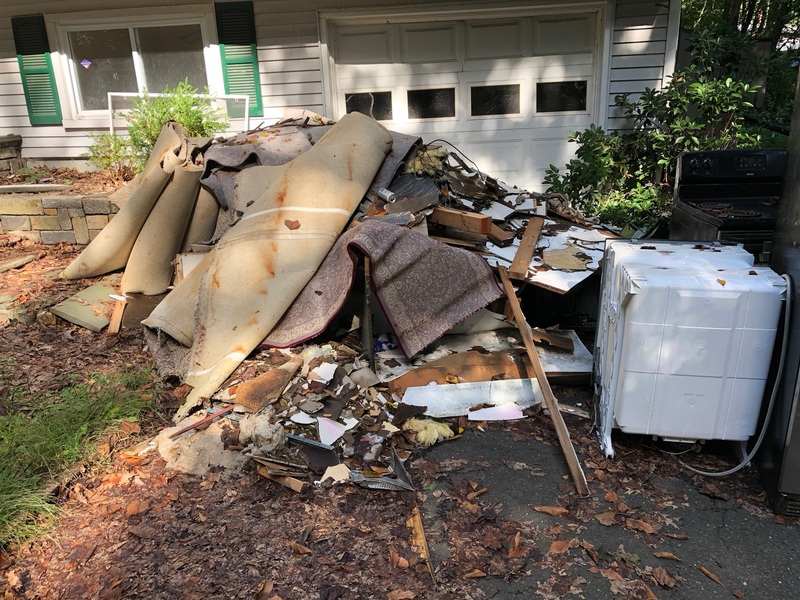 State Senate Majority Leader Bob Duff (D-25) had reached out to the Norwalk Building Department on Sept. 17 but “it just seems to be in limbo; at least they (could) clean up the driveway and yard with a dumpster instead of not giving a damn about the neighbors having to put up with this health and eyesore,” the neighbor wrote. 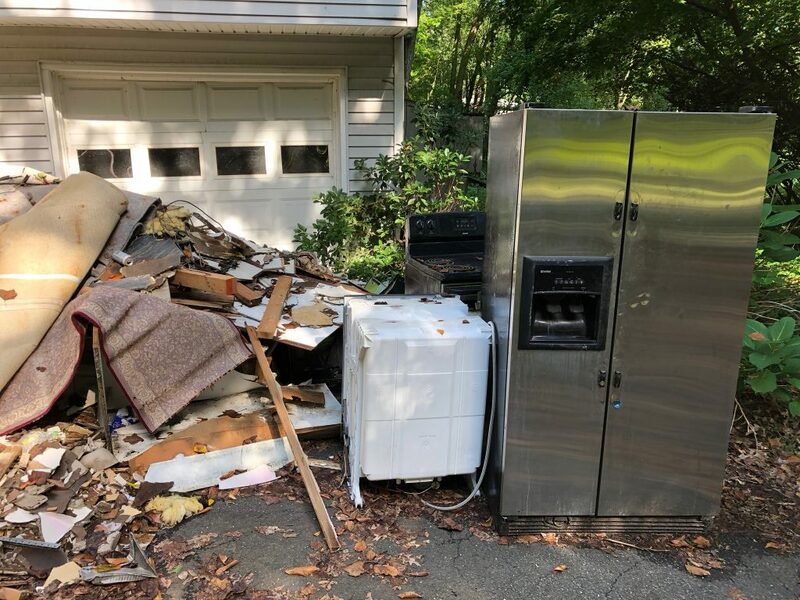 The resident emailed again a short while later to say that he had been told that the Health Department was addressing the issue. Director of Health Deanne D’Amore confirmed that the department has taken action. AB Square LLC is based in Wallingford, according to the Secretary of State’s website. Thank you NON for letting us know about all three matters! Duff did a great job with Firetree didn’t give damm there also. Next election lets take all the trash out. .
A few points of information/clarification: I didn’t take the photo credited to me. Based on my research, the public land was dedicated by the City to the late William Peters who launched “Norwalk Green & Clean” efforts some years ago. There’s a pedestal monument on site with this info. Question: How committed are we as a community to preserving the legacies of those remembered by plaques, statues, rooms, streets, trees, benches, etc. long after the initial pomp and circumstance? The concrete pads on the property are apparently the result of efforts some years ago by artist Brec Morgan – whose murals can be found in SoNo, Council Chambers, Rowayton School, etc. and a now seemingly defunct non-profit’s efforts to create a sculpture park at this location some years ago. Thanks Susan! The photo credit is updated. For countless decades Wall St. Merchants have complained bitterly about the detrimental effects of lack of parking and the cost of tickets on their businesses. Along with perceptions that Wall St. “after dark” can be dangerous. What hasn’t been tried is the “gentle approach”. Namely giving friendly reminders to 1st or 2nd parking offenders And keeping the cost of tickets modest with only perpetual offenders receiving larger tickets. Secondly while the Downtown garage was a step in the right direction to increase its use at night, especially by seniors, we’d need more visible police presence at the garage and the street leading to Wall St. Norwalk’s Downtown has a perceived “crime problem”. Everyone who reads the daily Hour is made aware of our City’s “crime problem”. As are residents of our surrounding towns. Visiting our neighboring towns at night, where the incidence of violent crime remains very low, one invariably sees a major police presence. Lets encourage a much larger visible police presence Downtwon especially at night to see if public perceptions of an unsafe Downtown can be changed. Real cities that attract City residents need attractive Downtowns where visitors feel safe. Norwalk hasn’t made much progress here. Few seniors I know visit Downtown at night. Because they feel unseasy about parking in a safe place. Our Mayor as a former Police Chief might want to increase police presence Downtown. And if we need incxase the Police Budget fine. Historically Norwalk’s violent crime figures have been higher than either Danbury or Stamford. Increase the Police Budget won’t happen. When this so called mall will open the new owners will need paid police details asap. Why would the city increase the size of the department cutting potential overtime coming our way for our force that hasn’t really changed in years. It will be the counsel will be looking at other cities who host malls for what they will need after the mall opens not before. Some agencies are on record as many and 20 new officers half detectives working what store crime prevention generates is needed, along with that transportation. Ct ave and Westport ave provide a steady flow of calls for just shoplifters and check fraud on a daily basis is it our city who is so slow in taking anything like that into consideration ? Our crime rate is disguised by Category , what use to take only a few minutes is now a truly complicated response time. These high rises are not 10 minute calls anymore for two cars two officers. Lawyers dot the city hall landscape some of our agencies have lawyers running departments none of these committed to better Norwalk sees this problem coming? Those life saving calls where recently our own police officer was credited in saving a life with CPR , soon we will have to choose who gets first dibs. All accounts say the officer saved a life. As it is our shelters are filled now the streets are showing an increase in traffic with the homeless and drug related calls our officers are pulling off miracles with what we have for coverage at times. Then you have those who see no crime hear no crime and simply won’t listen. NCC is now taking a lot of time out of Norwalks coverage I always thought it was the State police who respond at NCC and also to the DSS buildings in silvermine but now increased calls for help on 95 the connector and The Merritt from the State police suggests even our own State Police need help. Having a Mayor with police experience doesn’t seem to be working, it was obvious with the long drawn out battle with the prison half way house we are still involved with has shown poor history with protecting the city with some prevention and clear determination to keep our city safe. City grows yet our emergency services don’t. Police Emt and fire will all have new responsibilities with the new mall new high rises and new residents, where are the requests for expansion? Mistakes are still being made after all the red flags from lack of zoning laws and and no clear path to protect the city from more attacks on our safety and quality of life. Recently we heard 51 million gallons of waste was a record going to the treatment plant during a recent storm was a record (fact check please) and the mall isn’t even open and there is no end in sight for new high rises. You call this a city that plans, plans on what self created disasters? Part of be unsafe feeling in the Wall Street area is all the abandoned buildings. I personally don’t park in garages at night if I can avoid it. Besides the urine smell they are usually dark and why put yourself in that kind of situation if you don’t have to.